The Center for Detectors (CfD) is located in the IT Collaboratory and has large contiguous spaces for offices and labs, including offices for 17 people, and four research laboratories: the Rochester Imaging Detector Laboratory, The Imaging LIDAR Laboratory, the Quantum Dot Detector Laboratory, and the Wafer Probe Station Laboratory. There are approximately 5000 square feet of space, divided equally between labs and offices. The laboratories contain special facilities and equipment dedicated to the development of detectors. 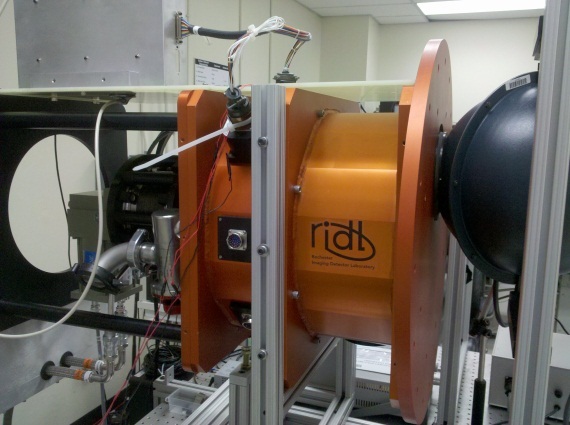 The RIDL detector testing systems use cylindrical vacuum cryogenic dewars. Each individual system uses a cryo-cooler that has two cooling stages: one at ~10 K (7 W) and another at ~60 K (70 W). The cold temperatures yield lower detector dark current and read noise. The systems use Lakeshore Model 340 temperature controllers to sense temperatures at 10 locations within the dewars and control a heater in the detector thermal path. This thermal control system stabilizes the detector thermal block to 400 micro-K RMS over timescales greater than 24 hours. The detector readout systems include an Astronomical Research Cameras controller having 32 digitizing channels with 1 MHz readout speed and 16-bit readout capability, two Teledyne SIDECAR ASICs having 36 channels and readout speeds up to 5 MHz at 12-bits and 500 kHz at 16-bits, and custom FPGA systems based on Altera and Xilinx parts. The controllers drive signals through cable harnesses that interface with Detector Customization Circuits (DCCs), which are designed in-house and consist of multi-layer cryogenic flex boards. The DCCs terminate in a single connecter, which then mate to the detector connector. Three-axis motorized stages provide automated lateral and piston target adjustment. Two of the dewars have a side-looking port that is useful for exposing detectors to high energy radiation beams. The lab has a large integrating sphere that provides uniform and calibrated illumination from the ultraviolet to through the infrared. The dewars are stationed on large optical tables that have vibration-isolation legs. 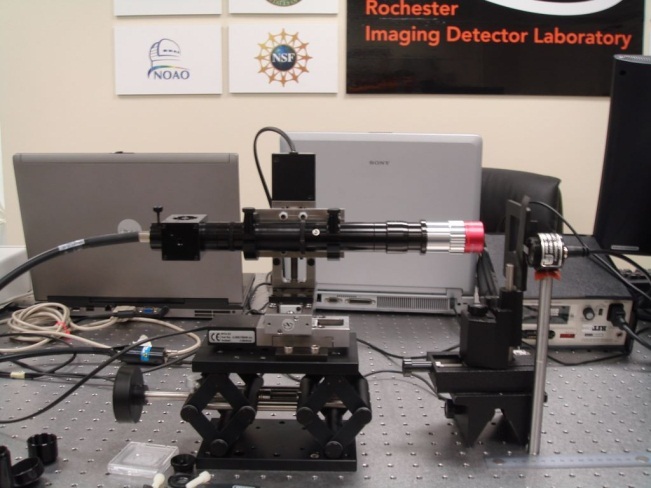 The Rochester Imaging Detector Laboratory has a Pico Quant pulsed laser for LIDAR system characterization and other testing that requires pulsed illumination. RIDL also has monochromators with specialized light sources for illumination from the UV into the IR (250 nm – 2500 nm). NIST-traceable calibrated photodiodes (with a wavelength range of 200 nm – 1100 nm) provide for absolute flux measurements. 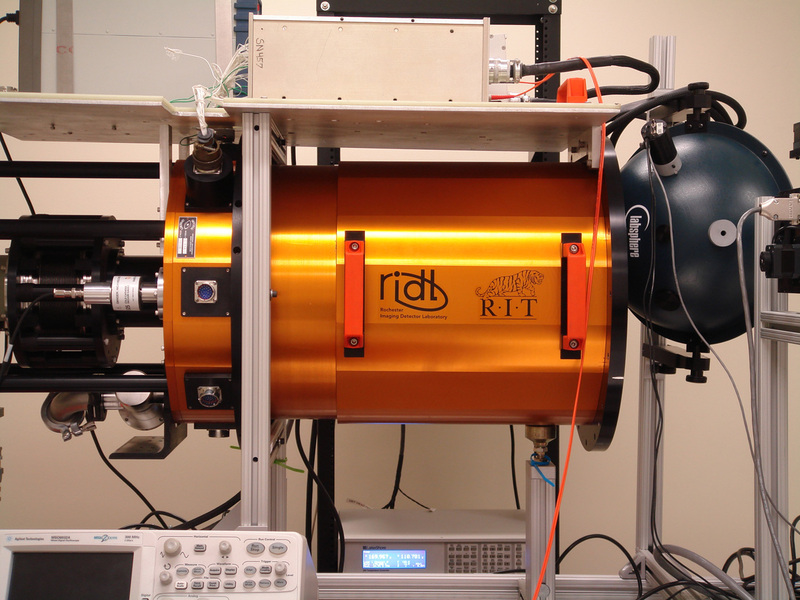 RIDL also has a spot projector to characterize the inter-pixel response of the detectors, including optical and electrical crosstalk. The image to the left shows a laser spot projection system on a 3D motorized stage that produces a small point source for measurements of intrapixel sensitivity. The lab contains eight data reduction PCs each with eight processors and up to 16 GB memory for data acquisition, reduction, analysis and simulations and 25 TB of data storage. Custom software runs an automated detector test suite of experiments. The test suite accommodates a wide variety of testing parameters through the use of parameter files. A complete test suite takes a few weeks to execute and produces ~0.5 TB of data. The data reduction computers reduce and analyze the data using custom automated code, producing publication-quality plots in near-real time as the data are taken. CfD has a dedicated class 1000 cleanroom (by FED Standard 209E), located in the SMFL. The SMFL has 10,000 ft2 of additional cleanroom space in class 1000, 100, and 10. Using the SMFL’s resources, the Center can fabricate detectors with custom process flows and the freedom to use multiple process variations. 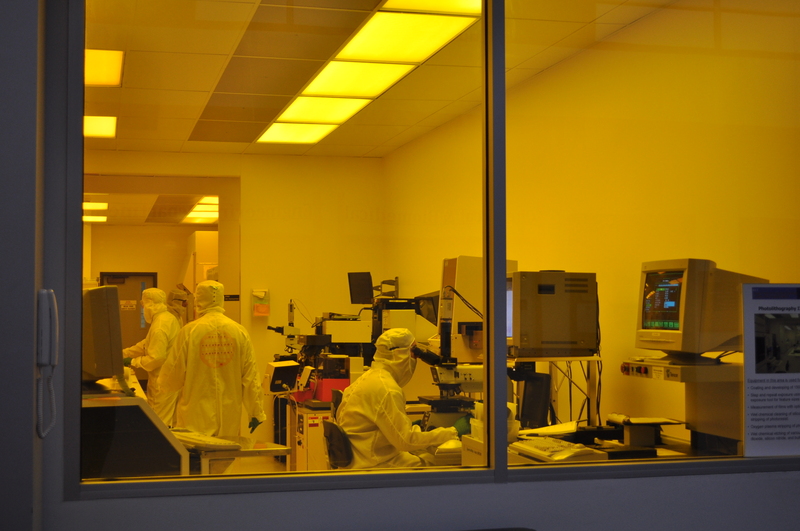 The Center’s cleanroom and probe stations allow wafer-level testing, even during the fabrication process, allowing mid-process design changes. 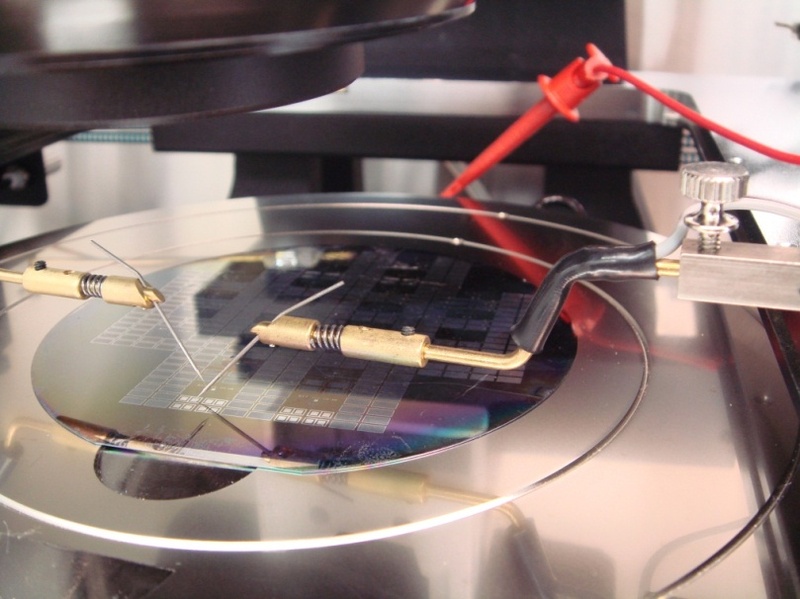 The probe station accommodates electrical and circuit analysis of both wafers and packaged parts, including low current and radio frequency (RF) probing. Also available for the CfD’s use are the Amray 1830 Scanning Electron Microscope (SEM), used for high-magnification imaging of devices, and the WYKO white light interferometer, used for surface topography measurements. 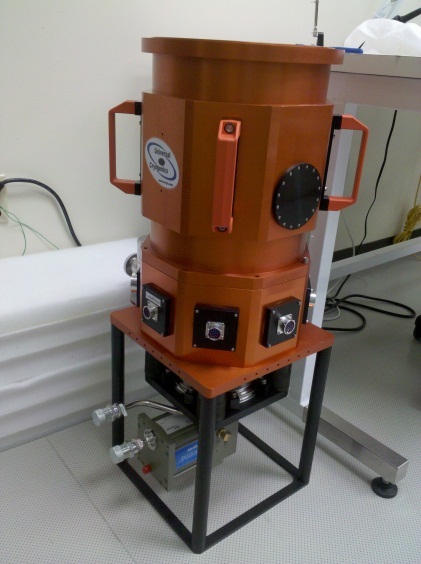 The SMFL also has other in-line fabrication metrology capabilities, including material layer thickness, refractive index, and wafer stress characterization tools. The customized setup shown here is comprised of two voltage power supplies, an Agilent oscilloscope, an LCD screen for viewing the devices through the microscope probe station, and a custom circuit board for specific device diagnostics. The dedicated lab computer also runs a specially-designed data acquisition program to collect and analyze data from the device. PhD student Kimberly Kolb conducts electrical experiments on one of the cutting edge devices being characterized at the Center for Detectors. The entire probe station is covered so that no stray light enters the testing environment. These conditions provide the basis for valuable testing and data analysis. The probe tip is contacting a single test device via a metal pad with dimensions of only 70 microns by 70 microns (an area of 0.0049 mm^2). This image is a close-up of a device wafer being tested on the probe station under dark conditions. Many other RIT facilities are available for use by the Center for Detectors. The Brinkman Lab is a state of the art facility devoted to manufacturing, and CfD uses it for precision machining, e.g., using a CNC machine. 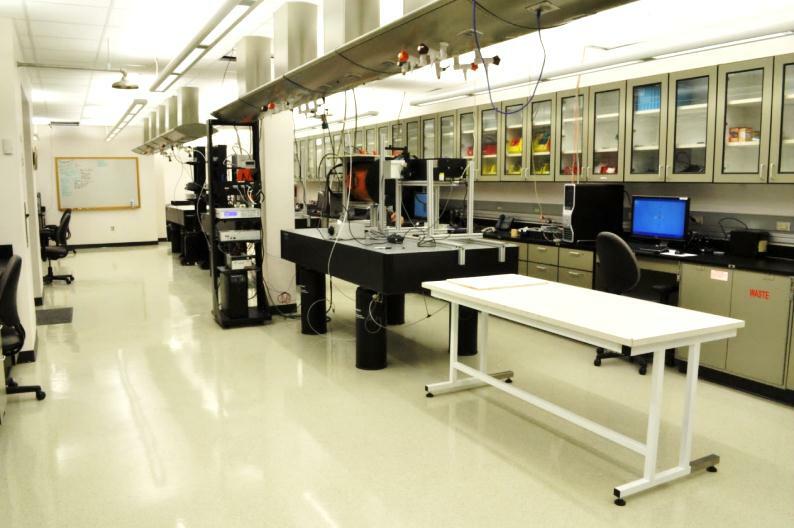 The Center for Electronics Manufacturing and Assembly (CEMA) focuses on electronics packaging, including semiconductor chip packaging, printed circuit board assemblies and electronics/optoelectronics. The CfD utilizes CEMA to populate surface mount components onto printed circuit boards (PCBs) that are designed in house. The facilities at CEMA are also ideal for reworking PCBs that need to be repaired or that require modifications. 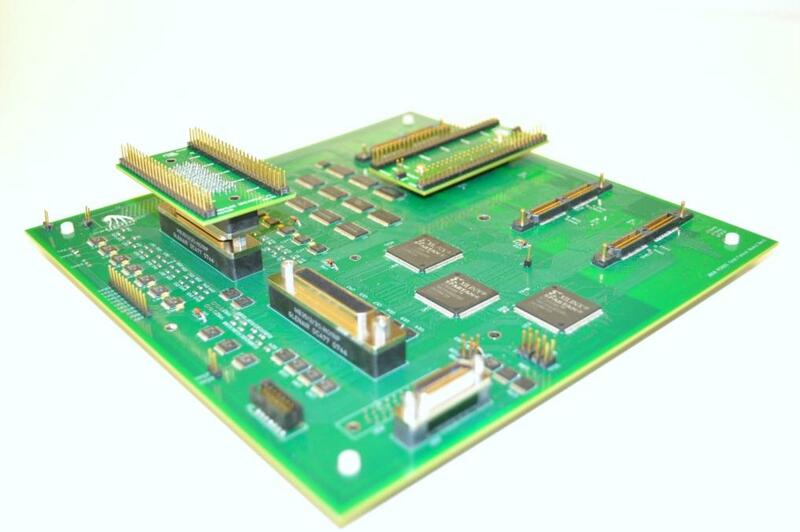 Cryogenic multi-layer circuit board designed in the CfD and populated in CEMA. Components on this board will be exposed to temperatures as low as 40 K, nanoTorr pressure, and high energy particle radiation. In addition to fabrication and testing capabilities, the Center for Detectors has access to sophisticated simulation software to predict the performance of devices, from fabrication processes to performance of a completed device. Silvaco Athena and Atlas are powerful software engines that simulate the effects of processing on device substrates and the electrical characteristics of a fabricated device. Athena simulations can describe all of the processes available in the RIT SMFL, building a physics-based model in 3D space of a device from initial substrate to completed device. From this model, the user can determine doping profiles, carrier densities, depletion widths, junction depths, and dielectric layer thickness, among other parameters, all from initial conditions set by actual fabrication process recipes. Multiple devices can be simulated in a single model, so both inter- and intra-pixel performance can be characterized. Atlas can then simulate performance by deriving, e.g., current-voltage, photovotaic, charge distribution, point spread function, and quantum efficiency (both internal and external) through user-defined operating conditions.